You can choose from many label designs for your fairy tale theme party favors! 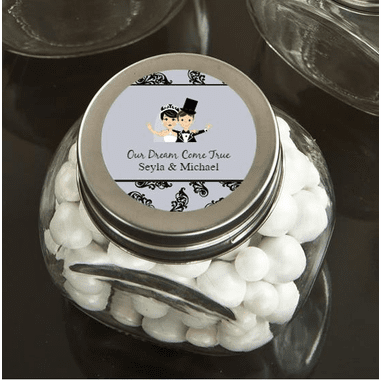 These are darling glass mini candy jars with loads of uses long after your guests have gone. Each glass jar favor measures 2¾" x 1¾". Approximately 80 regular size M&Ms® or 70 Jelly Bellies® can fit in a jar. From assorted color combinations, to adorable themed designs that match your occasion, to your own name and date, you can personalize your label and fill the jar with any number of treats to make it your own.